Drywall, mud and sanding complete, it’s on to the painting. 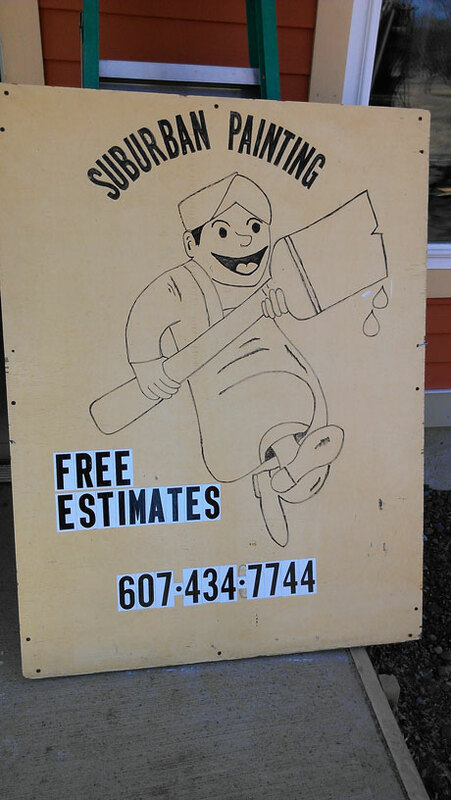 Our friend and neighbor Brett Hernandez of Suburban Painting is bringing his professional skills to the job. 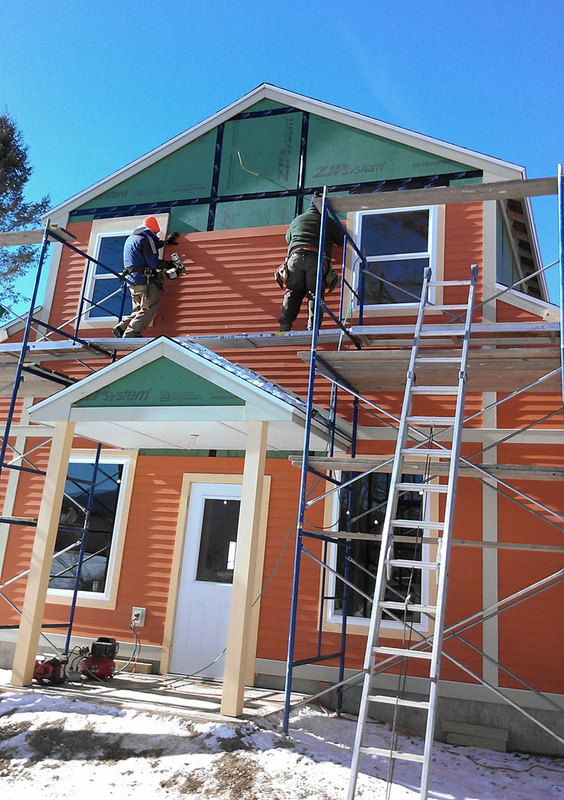 The siding on the new store building was finished in February. As you all know, there was a number of days the crew couldn’t work outside due to the extreme cold, but they got it done! I’m so glad Ray put the first coat of paint on the siding before it went up. It still needs another coat of paint, but even with just one coat it makes it look closer to being finished. While the outside is starting to look complete, there is still a lot of work to do inside the store. 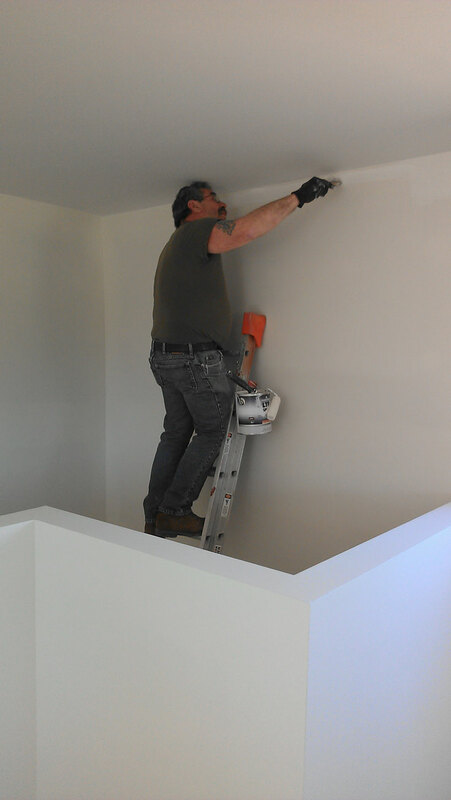 Ray’s been working hard on all the dry wall work. First putting it up, and then mudding and taping and mudding and taping, three coats and then it will be ready for sanding. Ray hates sanding. 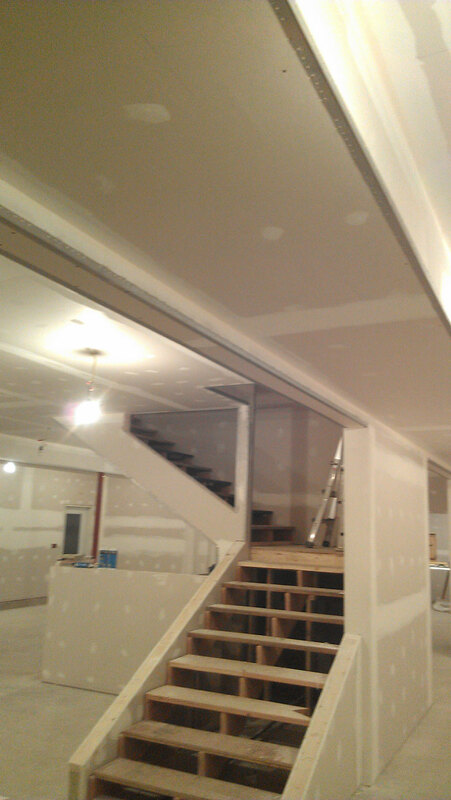 Here’s a couple pictures of the dry wall going into place in the new store. The first photo is of the left side of the store if you are standing at the front door. This is where the dog food section will be. The opening at the back is for the storage room. The second picture was taken from the front right corner of the store. 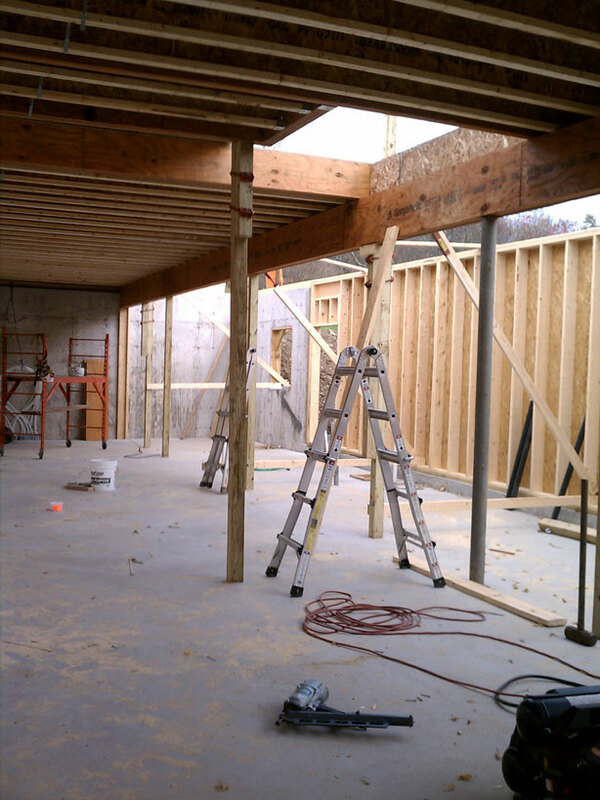 In this view you can see the register area that will be under the stairs that go up to the upper level. 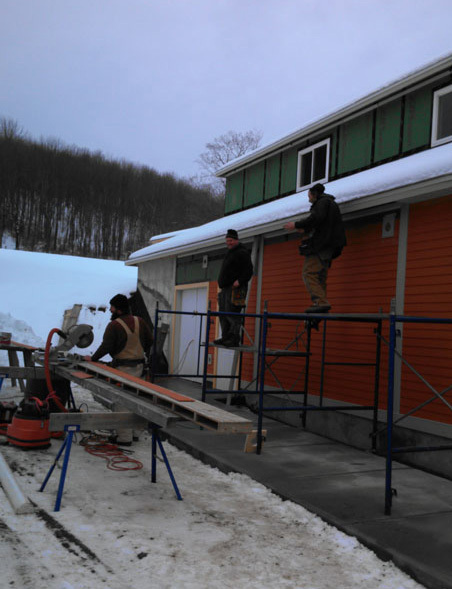 Bill Lamb Construction has been on the job since late December installing the siding on the new store building. This time of year the conditions aren’t always favorable for working outside, so when there’s a good day, they’re out there making the most of it. 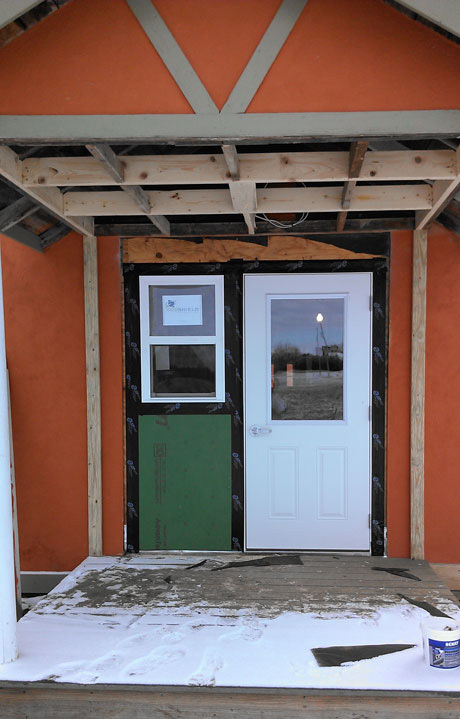 Over the last couple days, Ray installed a new, weatherized door for the overnight care entrance. It still needs framed out and finished, but it will be preserving a lot more inside heat than the old, single pane slider door that use to be there. Glen Highland Farm was asked by the Montgomery County SPCA to assist in the seizure of the Flat Creek Border Collies in Sprakers, NY. 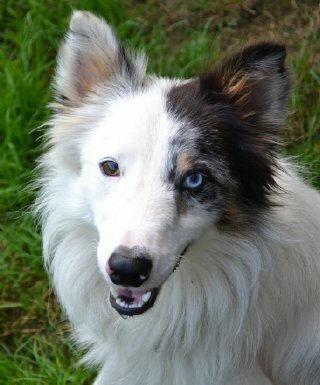 There are now 35 Border Collies in our care, with 25 of them fully surrendered to Rescue. Ten are in our care awaiting court proceedings. Each dog is being fully evaluated by veterinarians and rescue staff with respect to their condition. A full report will be provided to the SPCA. are NOT available for adoption at this time. We will not be answering any inquiries at this time. So the good news is that most of the Sprakers dogs have been surrendered and will now get the care they need. The big job for Glen Highland Farm right now is to get these dogs settled, vetted, cleaned up, and then to try to understand the personality and individual needs of each dog. While the Farm is not taking inquiries about these dogs, you can help by donating a bag of food through Dog Wild Canine Supply. We deliver to the Farm regularly and Taste of the Wild is the food used by most dogs at this time. You can find out more about the donation process on the Glen Highland Farm website http://www.glenhighlandfarm.com/dogsavailable.htm, or by calling Dog Wild at 607-547-5261. I’m not usually too political, but this one hits close to home, literally. Many of you have met our latest rescue Fennec. He was very lucky, he was bought out of Spraker’s puppy mill and ultimately ended up at Glen Highland Farm Border Collie Rescue and then at our house. But the puppy mill is still there and it’s run by someone who clearly sees these dogs as a commodity. This video was taken Friday with all the dogs out in the sub-zero temperatures. In one frame you can see a young dog huddled by the gate hoping for compassion. The police say the owner has not broken any laws and this may be true based on how the laws are written in NY. There is tougher legislation being proposed, but the governor needs to be encouraged to sign it. The deadline for a signature is January 10, 2014. 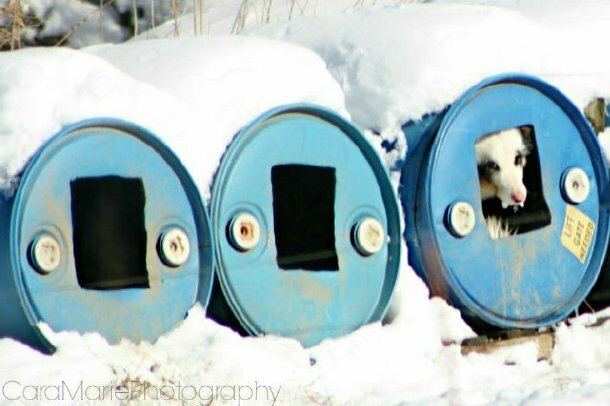 Learn more about the legislation and consider adding your voice to let the governor know that we don’t condone this type of treatment of dogs. Work continues on the new Dog Wild store building. 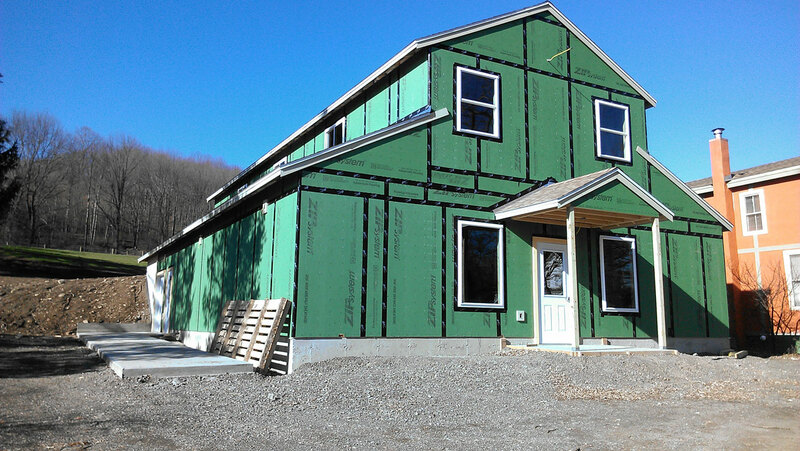 In the past few weeks, all the doors and windows have been installed, so the building is weather tight for the winter. 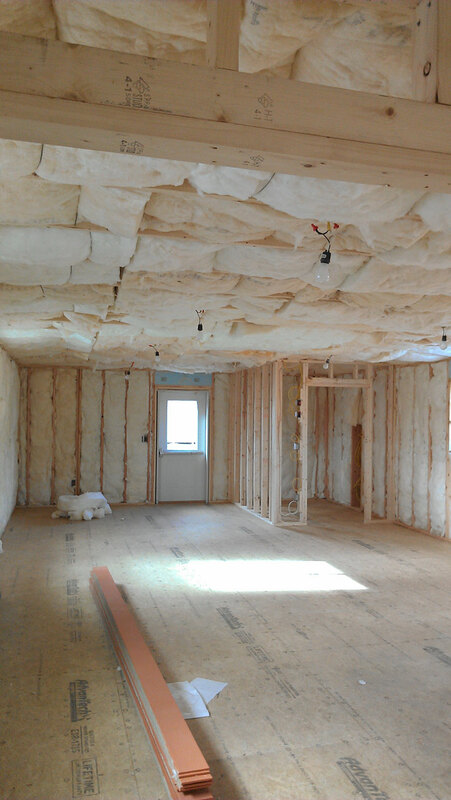 On the inside, all the electrical rough wiring has been complete and all of the insulation has been installed. 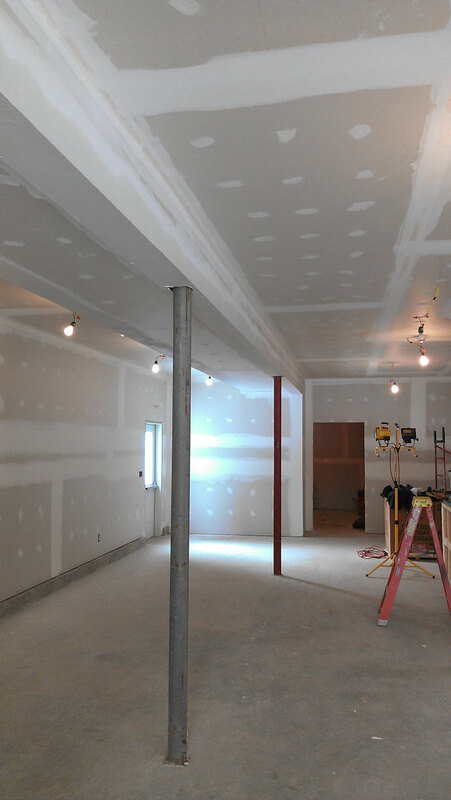 The inspection is complete, so the next step is covering the ceiling and walls with drywall. While we can put the drywall up without heat in the building, we won’t be able to tape and mud anything until we can warm up the space. The good news is that Norton’s is due to come in this week to install the boiler and get everything hooked up. 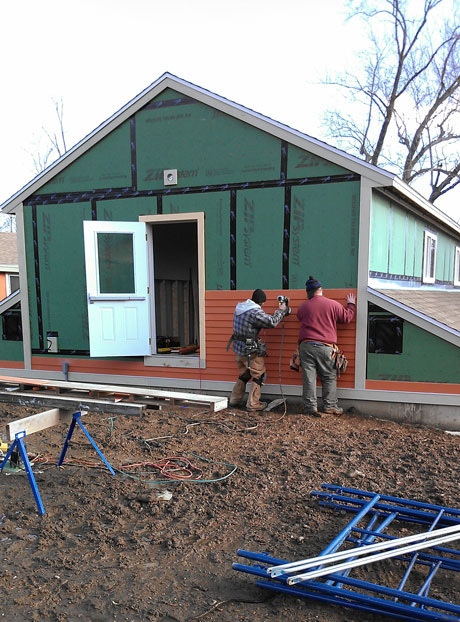 On the outside of the building, the next step is to install the siding. That will happen when our contractor gets freed up from some other projects, but in the meantime we put one coat of paint on everything to give it a head start. We’ll give it all another coat in the spring when the weather warms up. 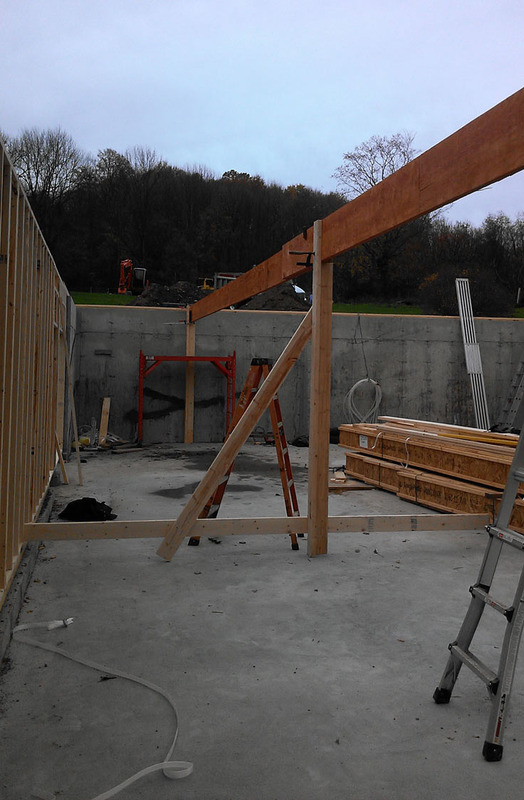 Now we’re getting to the really fun part – the new store building is going up! 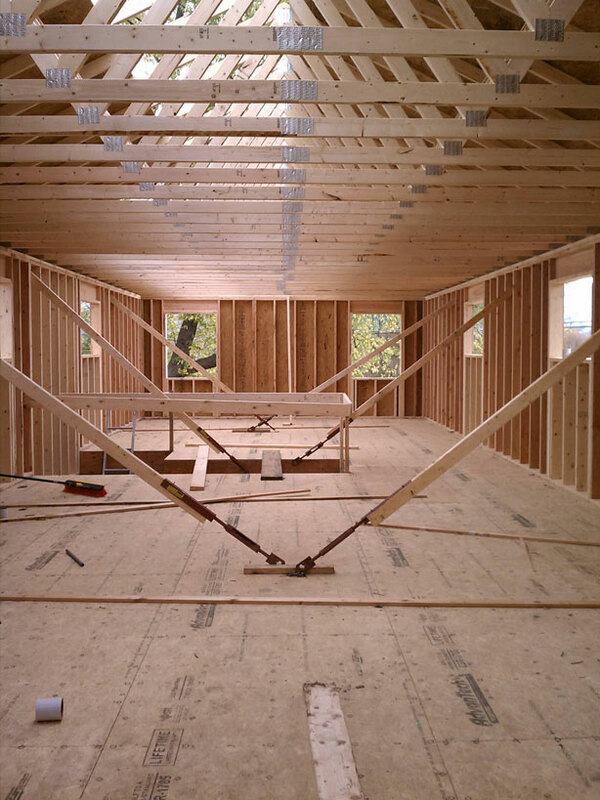 The walls were fabricated by Quality Construction off-site and delivered, ready to be put together like a big jigsaw puzzle. Ben Inglalls and crew got to work within a couple days the first floor was up and the deck laid for the second floor. 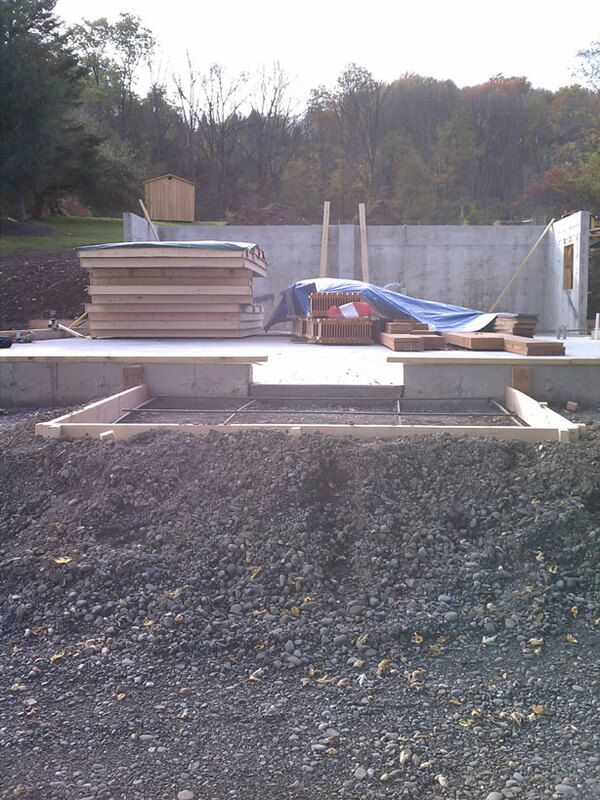 The opening in the deck will be for a staircase that will provide interior access to the second floor. 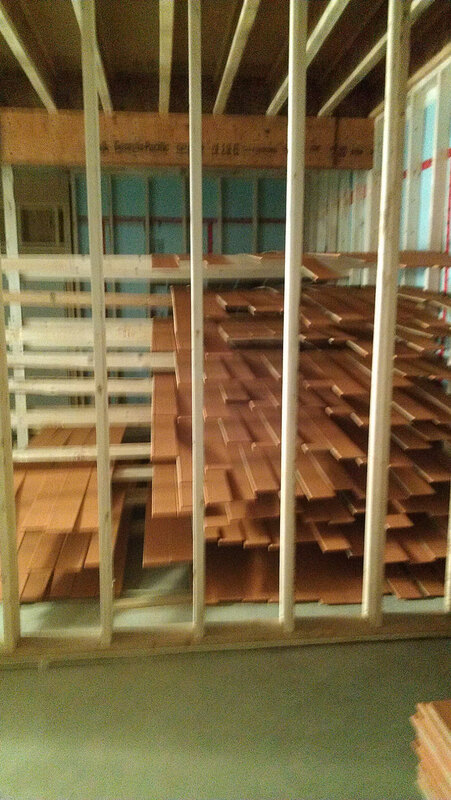 The second delivery from Quality Construction brought the walls for the second floor and the roof joists. 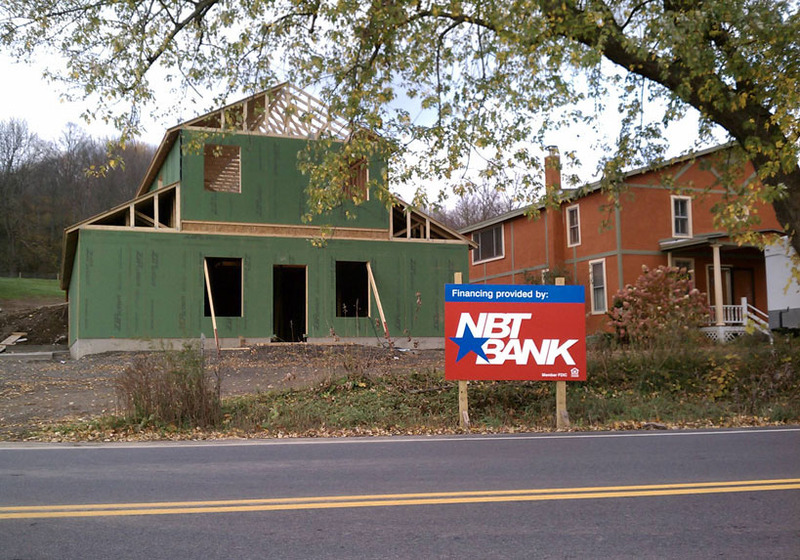 With the second floor erected, the framing was complete and the plywood for the roof was put in place. 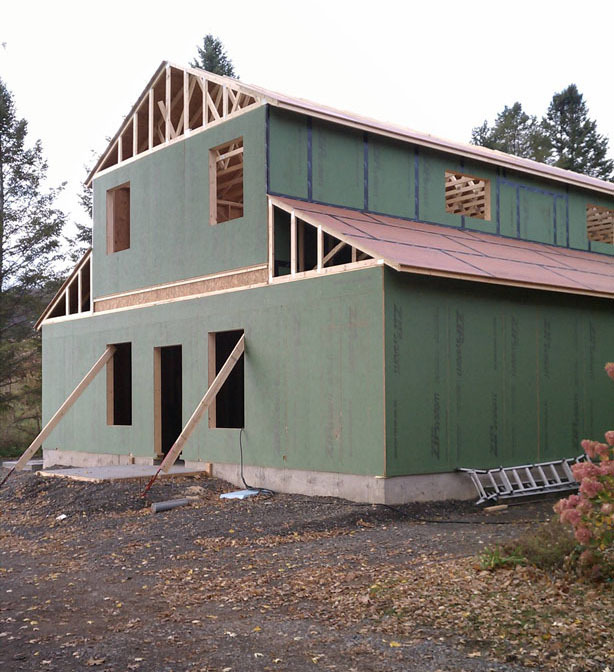 The building structure is a Zip System® and the seams are covered with Zip Tape, all the latest in modern construction, it’s insulated plywood and made to withstand weather during the construction phase, as well as eliminate the need for house wrap. 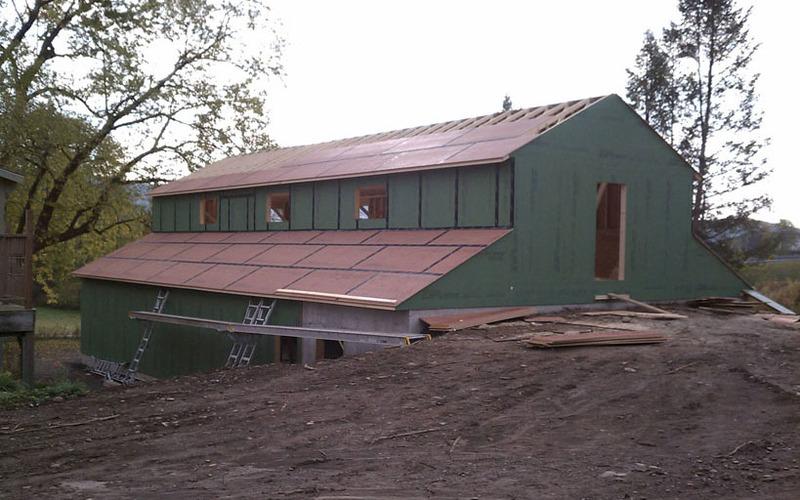 Here are some pictures of the almost completed building structure. So, the first floor of the new building will become the new retail store location. The second floor will be some storage and will have a room for events or indoor doggie daycare in bad weather. The adjacent house will be remodeled for doggie daycare and overnight care on the first floor, with a caretaker’s apartment on the second floor.